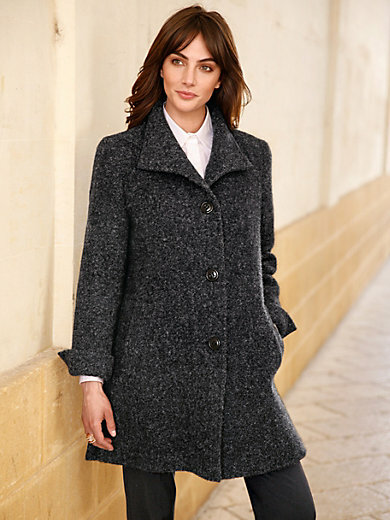 Coat by Peter Hahn. A true novelty made from premium quality new wool and elegant alpaca hair. The high pile woven fabric is notable for its wonderfully soft touch and exceptional lightness. Cut in an A-line shape with a fashionable turndown collar. Finished with decorative, colour co-ordinated buttons, 2 slanted banded pockets and 1 buttoned inside pocket. 52% new milled wool, 40% alpaca, 8% nylon. Lining made from 100% viscose. Length approx. 33ins. The coat should be dry cleaned.